Every project starts with an idea. The Rotary District Governors of Zones 33/34 came up with an idea a couple years ago to get together in Jamaica with a Centennial project to begin their year of service together as District Governors of Rotary International in Zones 33 & 34. 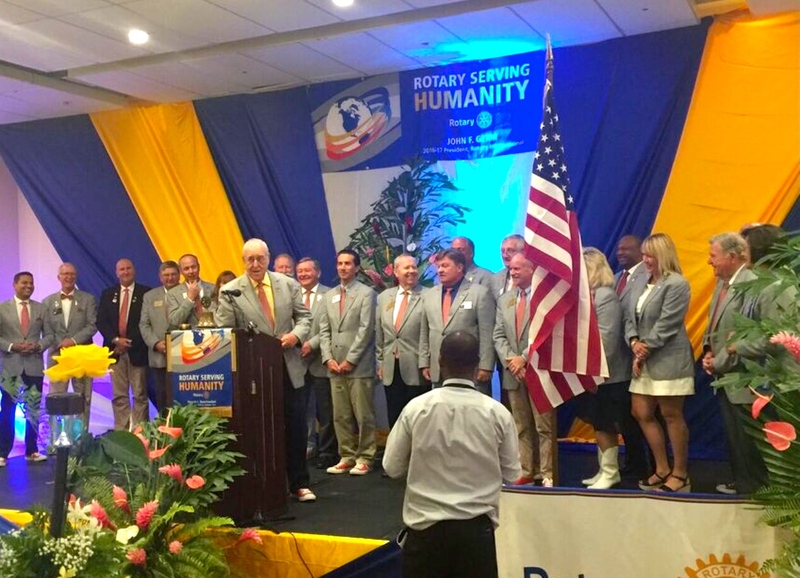 Further, the idea involved Rotary International President John Germ accompanying them, and ceremoneously inducting them as governors for their respective districts while there. This idea ultimately became two projects. 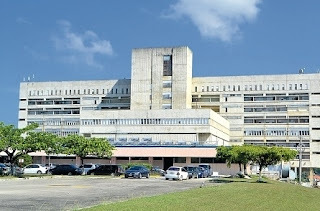 One of which involved presenting a cataract surgery machine to Cornwall Regional Hospital, a 10 story, 400-bed public hospital in Montego Bay, Jamaica. This public hospital is the only hospital outside of Kingston providing specialist services treating approximately 500,000 Jamaicans annually. The US$80,000 cataract machine project was a multi-district global grant project funded jointly by The Rotary Foundation. Twenty-one district governors of Zones 33/34 were in attendance for the presentation. Rotary International President John Germ and District 7020 Governor Haresh Ramchandani (our hero for hosting and planning the event) is shown with the plaque that honors recently deceased George Tyson, a classmate from District 7610, with District Governors of Zones 33/34. 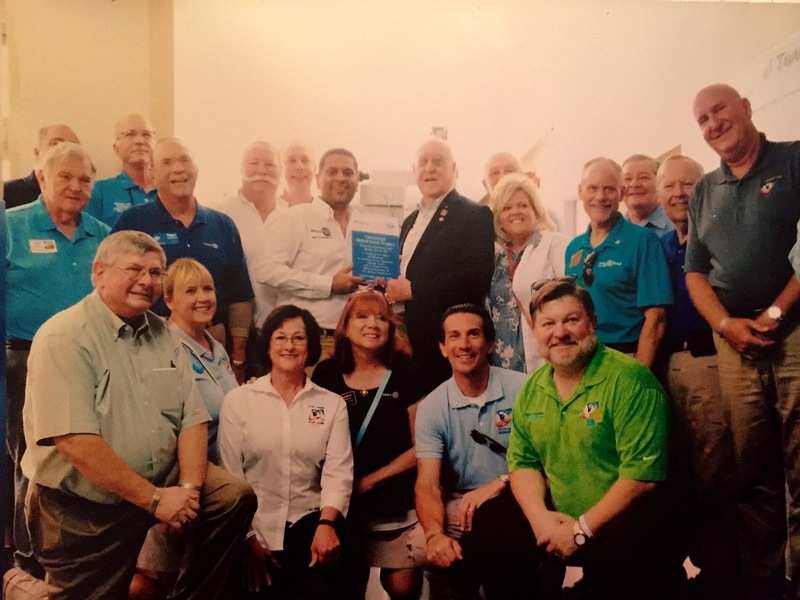 Shown here are District Governors Dan Semanza (our hero for writing the grant), Chris Runion, Lance Young, John Scibal, Cliff Hutton, Roger Champion, Tom Smith, Jon Spillman, Pam Lightsey, Eric Gordon, Gary Dills, Ladd Waldo, Mike Chapman, Marshall Butler, Sandee Brooks, Joyce Gunter, Kim Waters and Jim Finley. The District Governors then got involved in a hands-on project at Granville Child Care Facility (aka Granville Girls Home). 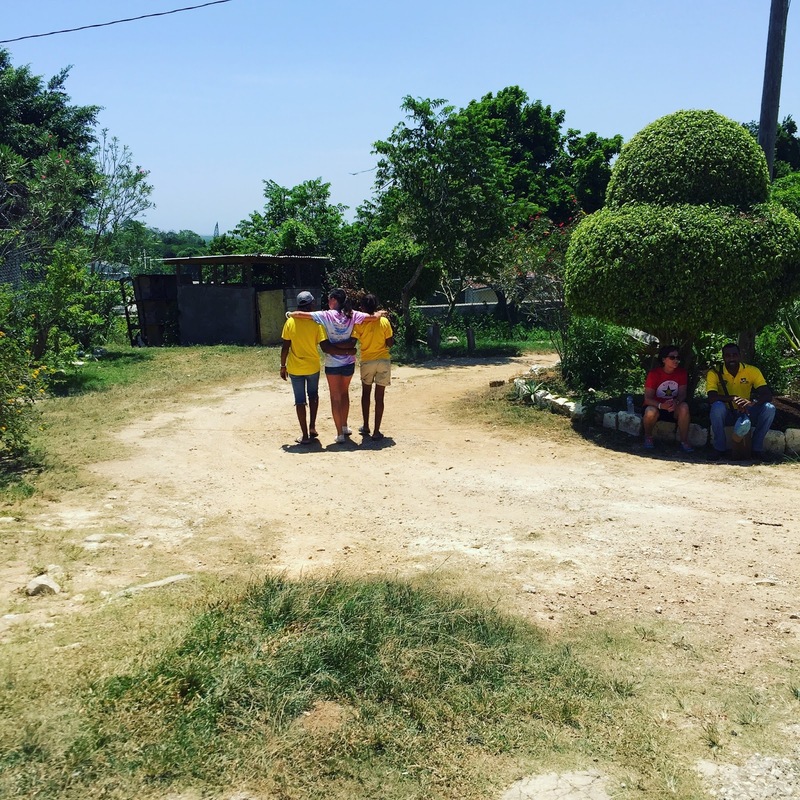 This home had 57 girls in residence on the day of our visit, with the youngest of these children, just 10 years old. The girls here have experienced varying degrees of trauma in their lives, including sexual abuse, neglect and exposure to violence, domestic and otherwise. Two very young girls looked to be fairly far along in their pregnancies. 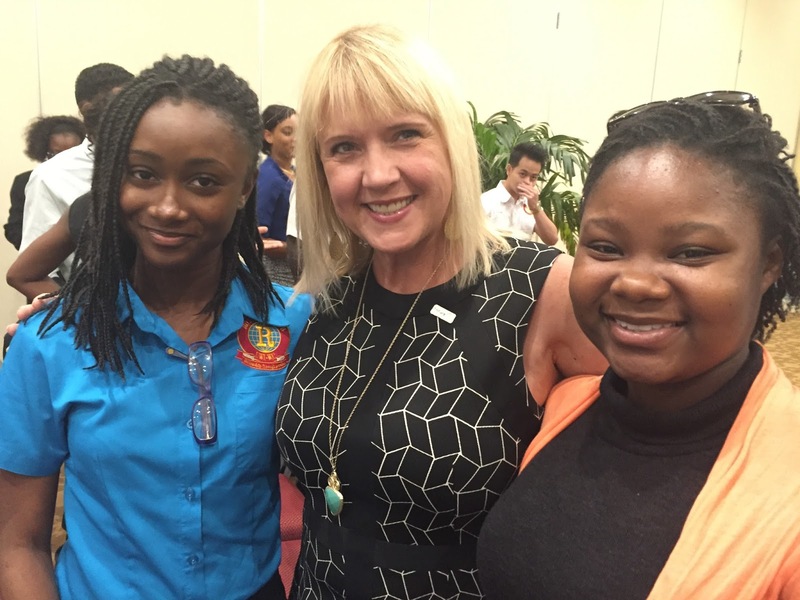 The girls are most receptive to counseling in a setting such as that envisioned by local Rotarians in a Peace Garden. 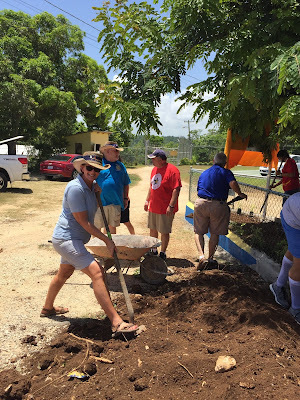 The Peace Garden project was funded by area Rotary Clubs with members working alongside the Rotary International President John Germ and Zones 33/34 District Governors with spouses and some of their children too, installing the Peace Garden. Edie Ray, spouse of District 6900 Governor Raymond Ray, shovels, while her husband, Raymond, talks with Rotary Past District Governor Gary Gunter (spouse of District Governor Joyce Gunter) as District Governor Ladd Waldo also does the work preparing the Peace Garden. 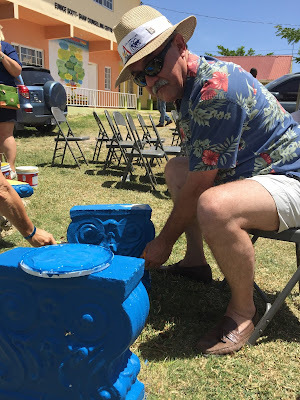 Zone 34 Regional Rotary Foundation Coordinator David Stovall, spouse of District 6910 Governor Kim Waters. District Governor Mike Chapman does some heavy lifting with Assistant Rotary Coordinator Jeremy Hurst of the Grand Cayman Islands. 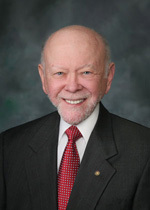 As President John Germ said when he saw this, "Now that's what it's all about." Emily Butler, daughter of District Governor Marshall Butler and Karen, befriended two of the girls at the home. 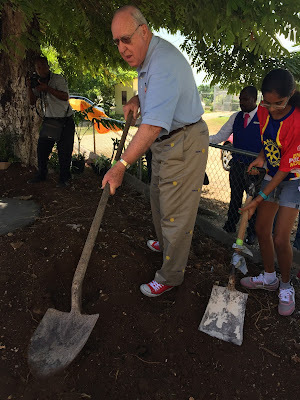 Rotary International President John Germ shovels dirt with Shya Ramchandani, daughter of District 7020 Governor Haresh Ramchandani and Vindu. 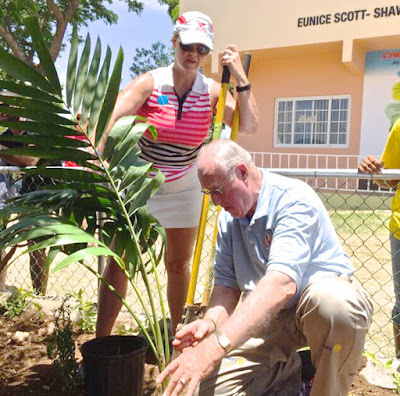 President John Germ plants the final palm in the garden, a 'peace palm', with District 6910 Governor Kim Waters overlooking. President John Germ, with wife Judy, in the Peace Garden, surrounded by Rotarians. 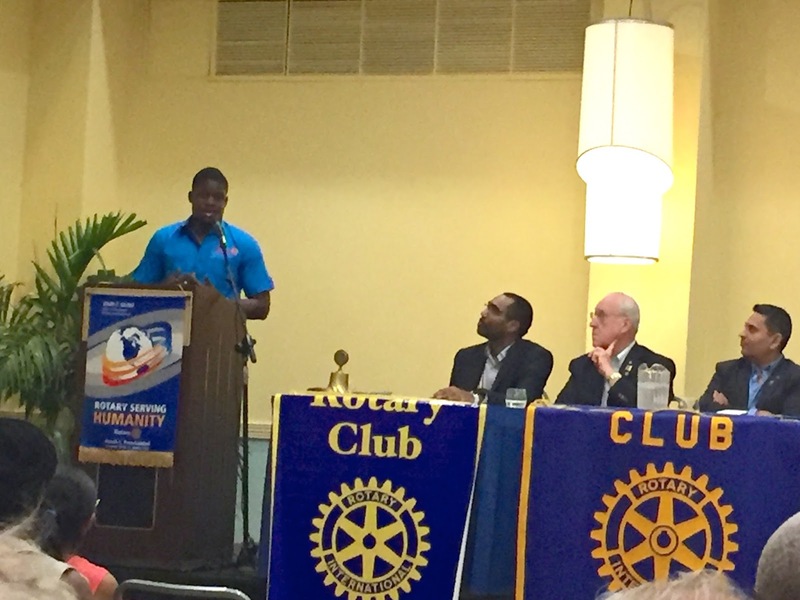 A multi-club meeting in Montego Bay started the weekend with these four area clubs sharing the good work of their area projects. President John Germ at sat the head table with four area club Presidents and District 7020 Governor Haresh Ramchandani. 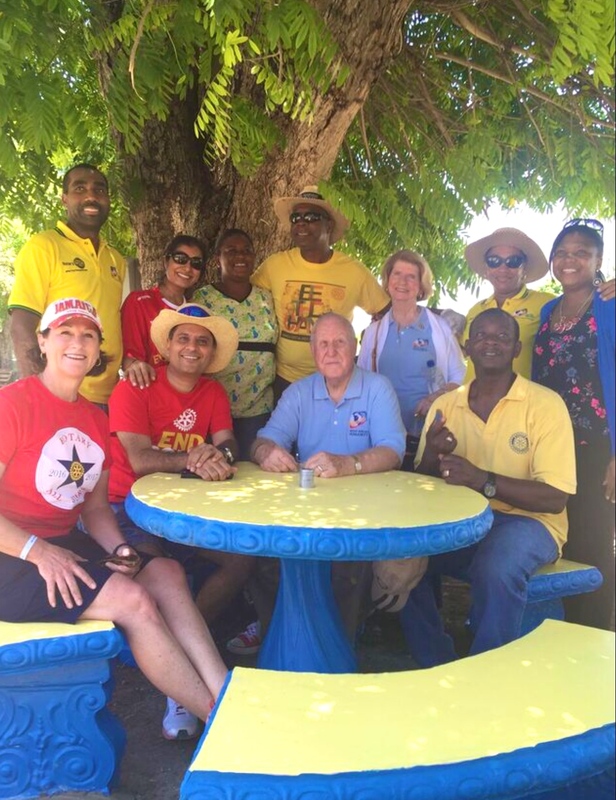 Club Presidents at the head table were from the Rotary Clubs of Falmouth, Montego Bay, Rotary Montego Bay Sunrise and Montego Bay East. Area Rotaract members also joined in the meeting as well. A Rotaract leader, Paul Thompson. addresses the meeting, with President John Germ at the head table along with the presidents of the Rotary Club of Falmouth Club President Claude Thompson and District 7020 Governor Haresh Ramchandani. 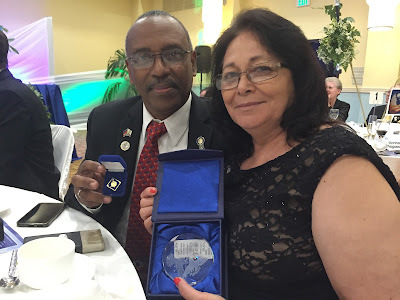 The weekend culminated with an Installation Banquet. 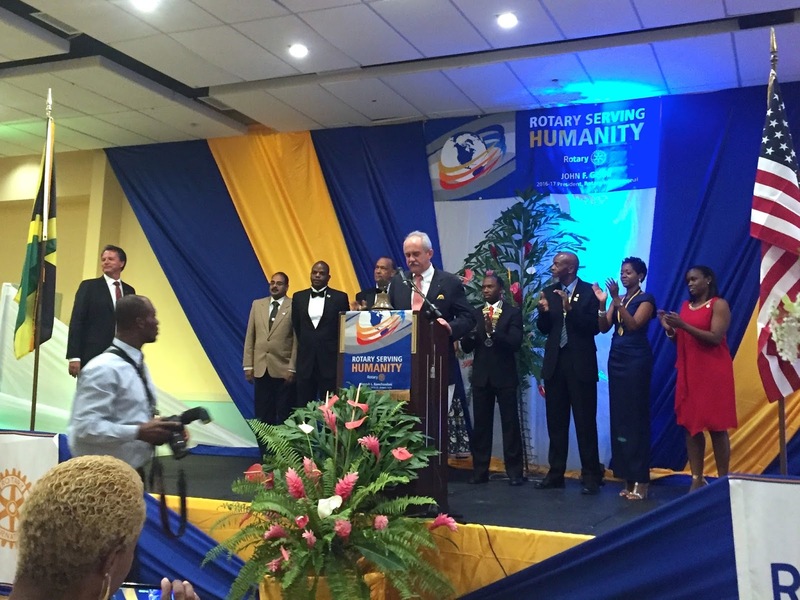 Not only were the District Governors of Zones 33/34 installed, over a dozen Caribbean club presidents were inducted as well. 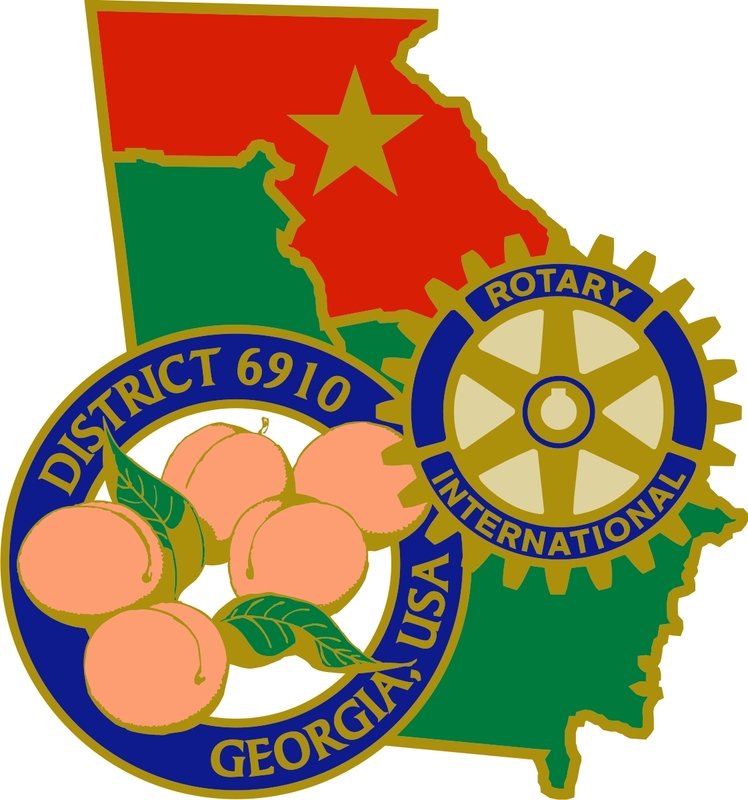 President John Germ inducted the District Governors, while Regional Rotary Foundation Coordinator David Stovall and Assistant Rotary Coordinator Jeremy Hurst inducted and then presented the club presidents to Rotary International President John Germ. 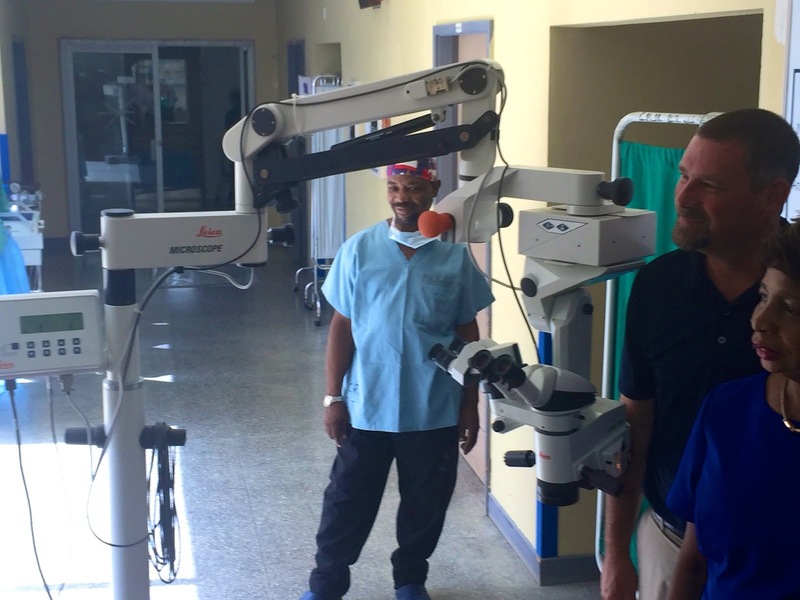 As District 7020 Governor Elect Robert Leger, a surgeon from Haiti said, 'Seeing this machine at the hospital brought tears to my eyes knowing of the lives that would be changed by this.' Fittingly, District Governor Elect Robert and wife Rosa of Haiti were later presented and honored with Major Donor Recognition by Rotary Foundation Trustee Barry Rassin of Nassau, Bahamas and Regional Rotary Foundation Coordinator, David Stovall. District 7020 Governor Elect Robert Leger and wife Rosa were recognized as Major Donors of The Rotary Foundation during the banquet. 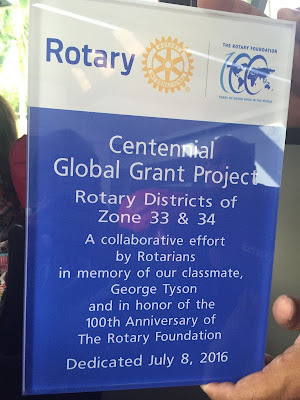 This installation of district governors with a multi-district project collaboration amongst a class of governors with the participation of a Rotary International President is the first of its kind in the history of Rotary. 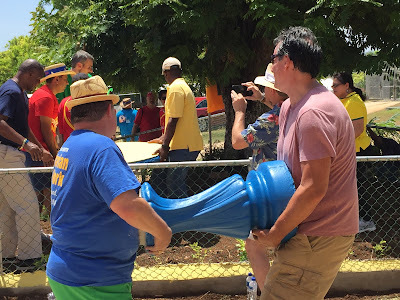 Truly, Rotary Serving Humanity.